Every week we pull together some great Canadian recipes from Canadian food bloggers around the web featuring one main ingredient or dish. Whether it's for a bridal shower, an afternoon tea, Valentine's day or just because you love pink, these pink foods will... well... tickle you pink! Pink foods may not be the first think to come to mind when you think of food but, they're perfect for so many occasions - showers, tea parties, mother's day, Valentine's day... or just because you love being in the pink! Which is why we pulled together these 39 pink recipes that are perfect for so may occasions. Whether you want some flirty fun, some delicate desserts or a bold, bright pink on your table, you'll find something here that's perfect! This [Decadent Chocolate Beet Cake with Candied Pecans](http://www.diversivore.com/recipe/chocolate-beet-cake-with-candied-pecans/) is an awesome cake for Valentine’s Day given the incredible colour, rich chocolate, and ready availability of winter beets. From **Diversivore**. Who here loves hummus? And who here thinks beets are pretty great too? When you put them together in this [Dilly Beet Hummus](http://www.evergreeneats.com/2017/10/26/dilly-beet-hummus/), you get a show-stopping dish that will brighten up your day not only with its vibrant colour but with the fresh flavours of lemon and dill. From **Evergreen Eats**. Cool and refreshing, these lighter [Watermelon Mojitos](https://thecookiewriter.com/watermelon-mojitos/) are the perfect pink beverage for Valentine's Day. The best part? They can be made with or without alcohol! From **The Cookie Writer**. 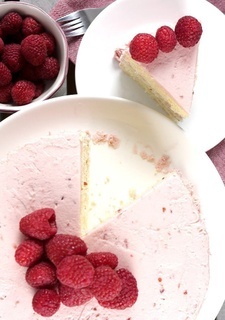 Soft, light and moist vanilla layer cake frosted with the most delicious raspberry buttercream. If you ever need a cake to welcome Valentine's Day, this bright and cheerful [Vanilla Cake with Raspberry Frosting](https://theunlikelybaker.com/vanilla-cake-raspberry-frosting/) is it! From **The Unlikely Baker**. If your love affair this Valentine's Day is with berries, then you've got to try this super healthy raspberry breakfast! These beautiful pink nuggets are stirred in with chia seeds and milk to create a simple and nutritious [Raspberry Chia Pudding](http://www.breakfastfordinner.net/raspberry-chia-pudding/). From **Breakfast For Dinner**. This [Pickled Egg and Beet Spinach Salad](https://www.dishnthekitchen.com/2015/03/27/pickled-egg-and-beet-spinach-spring-salad-a-ricardo-recipe-experience/) will make you feel as if the dreary winter had suddenly stopped existing, the sun came out and the birds were chirping. From **Dish'n' The Kitchen**. This recipe for [Valentine's Day Chocolates](http://www.cookinginmygenes.com/easy-diy-homemade-chocolates/) is super simple, only takes a little bit of your time and you end up with a really cute gift for the loved ones in your life. From **Cooking In My Genes**. The sweetness of the shells in these [Macaron Hearts with Raspberry Buttercream](http://www.beyondumami.com/2015/02/macaron-hearts-with-raspberry.html) balances quite well with the tartness of the raspberry buttercream, which is easily made with freeze-dried fruits. From **Beyond Umami**. These [Beetroot Ricotta Gnocchi with Brown Butter Gorgonzola Sauce](https://www.sugarlovespices.com/beetroot-ricotta-gnocchi-brown-butter-gorgonzola-sauce/) are soft, pillowy and showcase the unmistakable color and flavour of the beetroot. Perfect for a dinner date! They are also infused with a creamy-dreamy brown butter gorgonzola sauce. From **Sugar Love Spices**. These [Bombay Karachi Halwas](http://www.cookingsutra.com/bombay-karachi-halwa-cornflour-fudge-sindhi-halwa/) are not only gorgeously pink, they also have a special affinity for waistlines, and they are super addictive. From **Cooking Sutra**. Click on the images to go to the recipes! A big thank you to all our FBC Members who participated in this weekend's Pink Foods roundup. Do you have a recipe for rum cake? Beautiful! Love all the pink!! Each one of them looks fantastic. Thank you for including mine! What a great variety of recipes – something for everyone!